While not as cold as many places in the nation, the Piedmont Triad of North Carolina, including Greensboro, Kernersville, Winston-Salem, Oak Ridge, Summerfield, Stokesdale, and High Point, still has a few cold snaps during our winter that can cause water pipes to freeze and rupture. Periods of extreme cold, combined with wind chill, create a substantial risk for frozen or burst pipes. When freezing water turns to ice within the pipe, it expands and can block the water line. No matter if the frozen water pipe is made of plastic, copper or steel, blockage can create excessive pressure throughout the system and cause pipes to rupture or fail. Hundreds of gallons of water can escape in a single day from just one tiny crack in a water pipe. Among the inconvenience that frozen pipes can cause, the results can cause property damage, high repair costs and disruption of business. Master Plumbers of North Carolina has the experience and knowledge to repair frozen water pipes. From Winston-Salem to Burlington, no homes in the Triad are immune to frozen water pipes. If this happens to your home, the first thing you want to do is mitigate the potential for water damage. Shut off the water main leading into the home or business in order to reduce pressure on frozen pipes and minimize flooding if the pipes burst. If the frozen pipe is exposed and visible, Use a hair dryer to thaw the ice blockage. DO NOT use an open flame in an attempt to thaw the blockage. If the frozen pipes are not visible, Master Plumbers of North Carolina have the professional pipe-thawing equipment to quickly fix frozen water pipes. If you ever notice slower water flow in your home or business and think that you might have frozen pipes, you should call Master Plumbers immediately. In most cases, frozen pipes can be repaired before any long-term damage occurs. 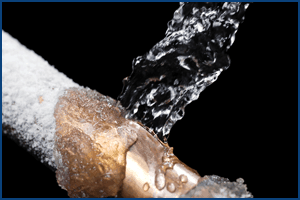 With 24-7 Emergency Service, Master Plumbers is ready to respond quickly to provide frozen water pipe repair. Local to the Greensboro, Winston-Salem, and High Point areas, our team of experienced plumbing professionals is ready to respond. Call our emergency frozen pipe repair line at 336-676-5544.